I found this photo on facebook today and it really made me laugh. 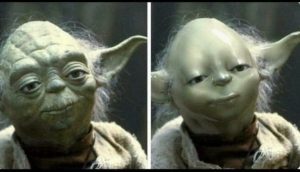 Yoda has a few wrinkles, its true, but too much photoshop and he doesn’t really look like Yoda anymore. The same thing can happen to your photos and you don’t want that. We do light touch ups because its important for your photo to reflect how your clients or future employer will see you. Your headshot is your brand and that needs to be how you actually look.